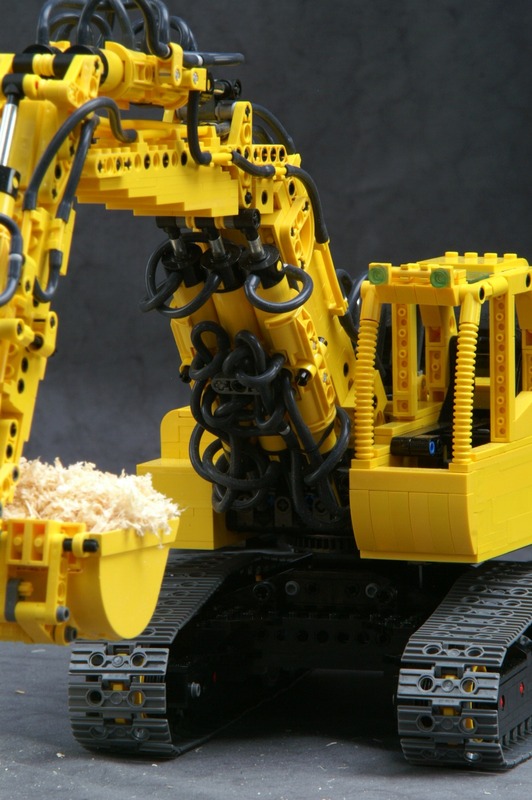 Not that remotely controlled in the sense we have been thinking of it, but here it is a video from two awesome Excavators that shown in LEGOWORLD this year. This is a model based on the CAT 318C Excavator (not an exact copy) made by 2LegoOrNot2Lego, in a video from Barry Bosman (barebos or barman), the man authoring and modeling several "proposals" for new Technic parts. Both LOWLUG members. It is operated with a RC with 8 functions, which also holds a compressor made of LEGO parts. The boom, stick and bucket are operated pneumatically, while drive and slewing are controlled by electric motors. The model is at a 1:17,5 scale. The image on the right side is a photo from the same 2LegoOrNot2Lego Excavator. It was found at his BS folder, where you can also find a lot more from the same model. Quite obvious but realize these were taken before the CAT stickers being applied. At YouTube, there is also another video with the model in this stage, made by its author. The second Excavator on the video is a model from Barry, a Kubota KX41-3v still not finished (WIP). It is a full electrical control model where the boom/stick/bucket are actuated by 3 Linear Actuators. I would be curious to see the axles routing more in detail. The truck seen also on the video is another story, for a new post not so far away. I'm amazed at the look of all those pipes on the CAT and although they are what make the model, I prefer linear actuators because they are much stronger and more precise. I wonder if TLG would make a yellow L.A. the same length as the pneumatic cylinders - that would make this model my favourite (I now hate pneumatics because of the introduction of the L.A.). "I wonder if TLG would make a yellow L.A. the same length as the pneumatic cylinders"
What you have described there is my worst nightmare LOL! Pneumatics are waaaaaaay better, they are faster, cooler, make a cool sound, can control many of them independantly at the same time with one motor/compressor and can be put in places inaccessable by a sturdy drive train and are more realistic. Their only downside (to me) is that they are too short. @Al: I thought we all had agreed that neither pneumatics nor LA's were better! Each system has its advantages and disadvantages (in a nutshell: LA's have controllability, pneumatics have flexibility), and choosing which one to use depends on the kind and characteristics of task is required. @AVCampos you're right, I could have worded what I said much better, i'm sorry. I should have included "in my own personal experience" before saying pneumatics are better as this is soley my own opinion. I still stand by what I said but I am still thankful for the existence of LA's as it does add new possibilities to technic so yes, I am glad both exist. This will further expand the boundaries of remote controlled pneumatic systems. There are many many people, including myself, that wish for that very same thing. There has been much discussion here regaurding just such an item with regaurds to it's uses and ways in which it could be made, and would be VERY well recieved. However I personnaly have not got my hopes too high for such an item from lego as I think each one would be quite expensive to produce. Whilst I, and i'm guessing many other AFOL's would gladly pay the high price for such an amazing item, i'm not sure if TLG are willing to put that much faith into the AFOL community to buy enough of them to make it worth while, but you never know, they may surprise us! Why make a new complex piece when a PF M-motor and the existing valve would do? It could not be done cheaper than that. What we really need from TLG is the pneumatic switch valve as an item on PaB online, so we can buy 100 at a time, and show each other more new ways to move them! An industrial pneumatic valve, used for Legoland rides, is not much bigger than the LEGO valve. Who will buy a few and try them out? One key is to remove the large deadband between the two directions of air switching. Another key is the large stiction of the valve switch, which uses up most of the motor power compared to the amount needed to switch the air flow. Simply because it would be much smaller, easier to control and offer a new whole way of building integrated and compact functions with pneumatics. A totally new way for remote controlled compact LEGO pneumatic toys/models and an increased LEGO experience. This is my personal believe. Others may disagree of course. A PF remote control valve would be very nice, i'de love TLG to release one but Mark Bellis is right. I think a better solution to remote valve switching is a new type of motor, a servo motor, with accomanying remote, that would operate like the steering output of the buggy reciever unit. You could attatch this directly to the valve and have proportional, automatic return to centre control of the valve. Bingo, romote PF valve. Another benefit of this motor is that it could be used for a host of other things like steering, point control, many other things in trains, and so on. The versatility of this motor in other applications and other themes makes me more hopeful of TLG producing one of those than a bespoke PF remote pneumatic valve. I wonder if most small servo motors would have enough strength to actuate the existing valves, in a reasonable small size setup. I'm still with some kind of electro-valves solution for compactness sake and smother integration in complex models. Oh yes they deffinately have enough power and are also very presice. This video on youtube http://www.youtube.com/watch?v=Gsfub53vDqc shows a servo mounted inside a lego block 4 studs square by 2 bricks high, controlling a lego valve with ease and automatic return to centre. With a different remote, proportional control may be possible. Some refinements to the design of the outer casing, giving it a PF format, would make it much easier to incorporate them into technic models.